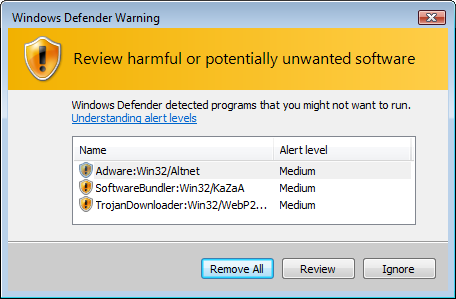 My how windows defender has grown up through the years; what started out as a small somewhat simple anti-spyware program has evolved into a largely effective antivirus tool. This free addition to windows 7 and 8 can now compete in effectiveness with a lot of the paid programs that are out there in the marketplace today. There really is no need to buy separate security programs for your computer with its recent improvements. Here is what it can do to protect your computer. Real time protection does exactly what the name implies; it protects your computer as you actively surf the internet. Windows Defender handles this task nicely and helps you surf the internet relatively worry free. Window Defenders main purpose in real-time protection is to protect against malware (short for malicious software). Malware can attack your computer in the form of adware, computer viruses, ransomware, worms, spyware, trojan horses, scareware and other types of malicious software that can be harmful to an unprotected computer. The program contains a large database of known threats to your computer. It will alert you to the fact that one of these threats is trying to take effect on your computer and then either stops it automatically or gives you a list of choices on how to handle it. Defender also will alert you if anything on your computer tries to change any windows settings without your permission. It is very important to keep Windows defender up to date with the latest downloads. By keeping the program current you will be protected against the latest online threats. There is nothing worse for your computer than to have malware or a virus infiltrate past your security system. Once in your machine, some types of malware and viruses can be next to impossible to get rid of. Sometimes threats to your computer slip through real time protection and can be very harmful to your computer and also slow its processing speeds down. When this happens, Windows Defender can help by scanning the important areas of your computer to detect these threats. The program will give you a choice of three scanning options. The first is a quick scan that does exactly what the name implies. It looks for malware that is hidden in just the key operating areas of your computer they normally lurk. That is the reason why the scan can be done so quickly. The second type of scan Windows Defender can do is a full scan. This is a more much comprehensive scan that looks at virtually every place in your computer that malware can hide. It takes much longer to perform this type of scan. The last scan is a custom scan option. It lets you choose where you want the program to look for malware on your computer. This type of scan is really meant for advanced users. So with its powerful one two punch of real-time protection and computer scanning, Windows Defender has truly become a much better protection program against the threats that try to make their way into your computer as you surf the world wide web.